One of the most beautiful and desired locations on the Gulf of Mexico! Escape to the sugar white sands of Gulf Shores. Don’t walk to the beach, stay on it and enjoy the sound of the surf and the spectacular view of the Gulf of Mexico from the private decks on the main level or upper levels. Away from the hustle & bustle of high-rises, located in a quiet area on the beach. Great for reunions and family activities. No Smoking. 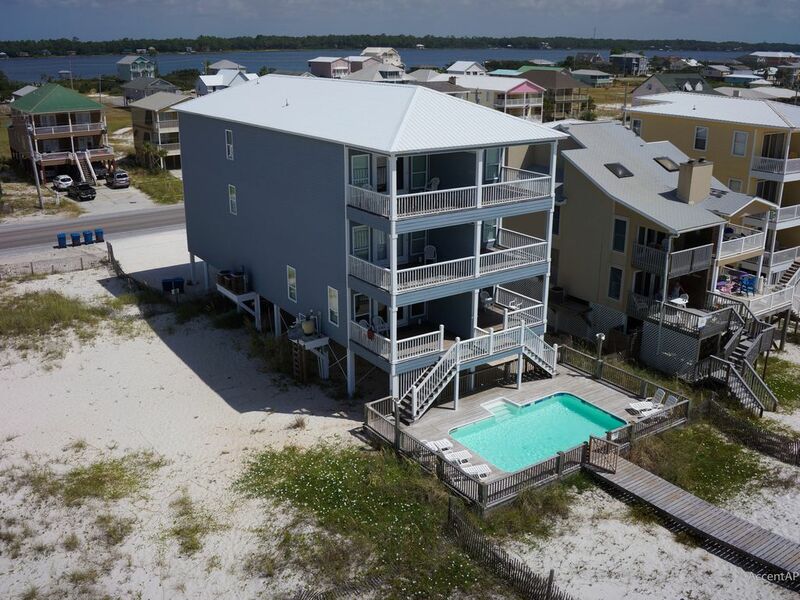 Our home (duplex) is located directly on the beach, in the heart of Gulf Shores with multiple decks offers spectacular views and sunsets. Our beach house has all of the conveniences of home. It is conveniently located approximately 2.3 miles west of Hwy. 59 on West Beach Blvd (Hwy182). The house is located on the absolute best beach area on West Beach. Gulf Shores small town atmosphere makes your visit to the beach comfortable and easy. Spend the afternoon browsing boutiques, gift shops and galleries, or hunt for name-brand bargains at local outlet stores. 'The Warf' in Orange Beach and the Tanger Outlet Mall, one of the South's largest factory outlet malls, are only a few miles away. On the first floor, there is a private Master Suite(King Bed). On the second floor, there is a private Master Suite(King Bed) beach side, a room with a set of full-size bunk beds, and another room with 2 full-size beds. On the third floor, there is a private Master suite(King Bed) beach side, a room with a set of twin-size bunk beds, and another twin-size bed; and the other bedroom has a king-size bed in it. Gulf Front decks on all floors. Second and third floors have Gulf Front master suites with spectacular views. Large screen TVs in living rooms. Reservations must be prepaid 60 days prior to arrival through credit card or E-Check. 50% of the total rental amount is due at booking and the remaining balance is due 60 days prior to arrival. If a reservation is canceled more than 180 days prior to arrival, all deposits and pre-paid rent amounts will be refunded. If a reservation is canceled less than 180 days prior to arrival, all deposits and pre-paid rent amounts will be forfeited. Gulf Front 14 X 24 Ft.
We needed a last minute Home in gulf shores to accommodate 16 people when we were evacuated from Florida because of a hurricane. Dean was beyond amazing to deal with and got us into the house that night. We could not have asked for more! The house was very clean, we loved the pool and being right on our own private beach was amazing. Just minutes away from gulf coast parkway with all our favorite restaurants. Again, I cannot say enough about how wonderful Dean was to work with. We would definitely stay in this house again! My family and I , a group of 18 from ages 6 months to 70, loved it .I have to thank Dean Young and his staff for providing great customer service, we had a incident with the stove, in 30 mins or less the property manager was here to fix it, There were a lot of issues with the TV's.But we came for the beach ,and we had fun.Thank you for allowing me to create memories with the people I love the most ! Thank you from the bottom of my heart ! This house was perfect for the 4 families who stayed together! It accommodates us just right. Although, slightly worn in some ways (compared to the pics) it is updated in others. The property manager was attentive when we had a problem with one of the TVs and brought a new remote right away. It’s perfectly placed, about 1.5 Miles from “the strip”. The pool was clean and perfect for the kiddos! It sits right on the white sandy beach. I would go back in a heart beat! We want to try and rent both sides for spring break 2019!!! Great location!! Great home away from home!! Amazing Beach House!!! Highly Recommended!! We rented the Endurance I beach house for an extended family vacation / reunion. We had such a great time!!! I want to thank Dean Young for a seamless and easy rental experience; extremely professional, concise, and quick to respond to any questions. The entire process for the rental from start to finish was great! We absolutely loved the property. It is well maintained and you cannot beat the location. The area of beach that the house sits on is perfect and not busy like other places in Gulf Shores. The house had all of the amenities that you could ask for in a beach rental property and was large enough to accommodate our entire group of 14 with ease. Our kids loved the pool!! Thanks again Dean and the Endurance Property folks. We will definitely be looking to rent this house again in the future! Note: Until confirmed, rates are subject to change without notice. Reservations must be prepaid 30 days prior to arrival by check. The security deposit and processing fee are due within 5 days from the date of booking. 50% of the total rental amount is due 180 days prior to arrival and the remaining balance is due 30 days prior to arrival. If a reservation is canceled less than 180 days prior to arrival, all deposits and pre-paid rent amounts will be forfeited.